The cool air of September is making my rose bushes bloom magnificently! We had to steal a vaseful from the hidden sides to bring indoors to enjoy. 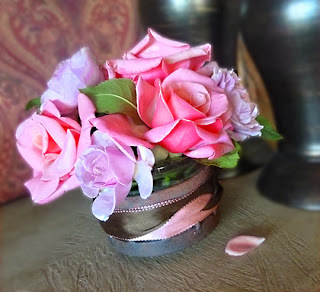 A shallow rustic candle vase is transformed with a bit of brown and pink satin ribbon. Mmmmmm - they smell fabulous!